A common question about Order Desk is how to handle returns, or if it's even possible. Because Order Desk is a uniquely customizable order management app, the answer is that it really depends on many factors. These factors include the integrations being used, the workflow in place in a particular account, and the details for each specific store. There are ways to use Order Desk to make sure returns are handled properly. This guide explains what is possible and will make handling returns a little less ambiguous for Order Desk users. There are a few options in Order Desk for marking orders as returned. The most common are to use folders, notes or tags. It is also possible to come up with your own custom solutions that could work. If you want, you can create a folder specifically for all returned orders. When you handle a return, move that order into the Returns folder. Keep in mind that the folder is only a label. 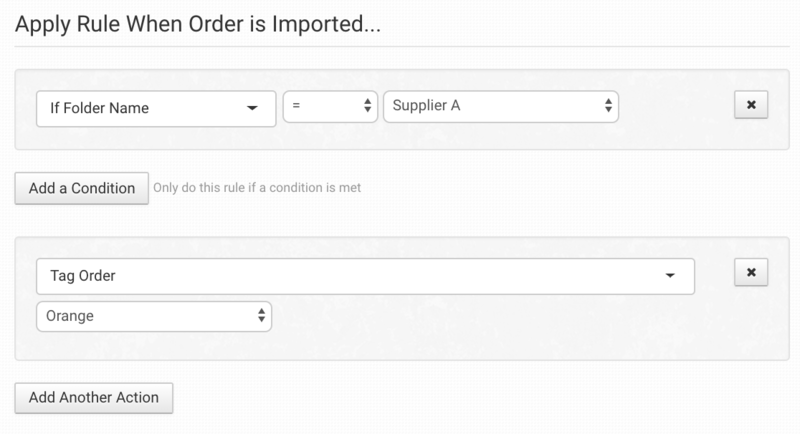 If you need to take any actions on the orders after you move it to the Returns folder, you will need to either set up rules or manually act on the order. Folders can be created from your Store Settings. A second option is to leave an internal note on the order for your own reference. Notes can be added in the order directly. Scroll below the item information to find the notes section. When a note is added, it will include the name of the store user who wrote it as well as the date and time it was added. A third option is to use a tag color to represent returned orders. Tags come in six colors: green, red, blue, yellow, orange and purple. Red is sometimes used to tag fraud risk orders and green to tag orders that are waiting for action to be taken on them, however you can decide what the colors mean and how to apply them within your own store. If an entire order or a partial order needs to be re-submitted to an integration for fulfillment, this can be done from Order Desk. Most integrations will not accept an order that has already been sent to them. Duplicate orders are almost always rejected with the error "order has already been submitted." The way around this is to change the order number first. Follow the steps below for how to resubmit a partial order or a full order to an integration. If you use OIA Global for fulfillment, they have a different process for resubmitting orders. Please see the OIA Global Integration guide for specific instructions. To re-submit part of an order, first split the order. This creates a new order for the item(s) that need to be sent for fulfillment again. This new order can be manually submitted to your fulfillment integration now that it has a new order number and only has the item(s) from the original order that need to be fulfilled. If the entire order needs to be resubmitted for fulfillment, the order number will need to be changed so the fulfillment service will accept it as a new order. The order now has a new number and can be manually resubmitted to your fulfillment integration. Depending on the shopping cart integration and the payment processor being used, in some cases, you will be able to process full or partial refunds directly from Order Desk. For more information on refunds, please read the Refunding and Capturing Payments guide. If your inventory is not being updated by your fulfillment service, you will need to add stock back directly to your returned items in Order Desk. This will sync the correct inventory back to your shopping cart. For more information, see the How to Work with Inventory Counts guide. Does Order Desk process returns? Order Desk does not process returns, but the app can be used for orders that need to be returned, refunded, exchanged and/or re-shipped, depending on the specific setup of the account. What works for one store may not work for another depending on preferences, workflow, settings and integrations, among other factors. Once an order has been imported or added to Order Desk, it is usually best to manage that order from within Order Desk, including handling returns when possible. This may be as simple as refunding the customer's payment, making a note on the order about what happened and moving the order to a different custom folder. If your shopping cart integration and payment processor don't allow you to make refunds through Order Desk, be sure to update orders Order Desk as well, if necessary. What is the best way to return an order? As with any process in Order Desk, this will depend on your specific store. Please read through this guide for suggestions and options for dealing with returns in Order Desk. How do I mark a return? There are a number of ways to mark an order in Order Desk as being a return. This guide goes over these options in more detail, but some of the ways to mark a return are to use a specific tag color to signify returned orders, create a custom folder for returns or add order notes to provide more information about the order and its return status. Depending on the integrations and payment processors your cart uses, you might be able to process full or partial refunds from within Order Desk. For more information on processing refunds, please refer to the Refund and Capture Payments guide. For information on canceled orders, please refer to the How to Cancel an Order guide. Can I create a return label with EasyPost? Yes, you can create an EasyPost return label and send it to your customer from Order Desk. For more information on how to work with return labels using EasyPost in Order Desk, please read the guide on Create Labels with EasyPost.